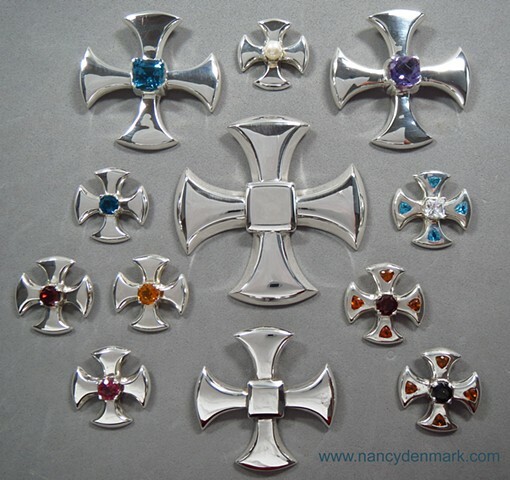 All of these crosses may be found with prices and purchase information in the web galleries featuring "From the Heart Line" designs without gems and crosses with gems. The original Canterbury Cross dating from circa 850 A.D. was discovered in 1867, in an excavation beneath St. Georges Street in Canterbury, England. This cross is widely recognized as the symbol of the worldwide Anglican Communion, of which the Episcopal Church in the United States is an integral member. Canterbury presents to the world a picture of past faith and present hope. Canterbury is the site of the first church established by St. Augustine when he came to Christianize England in 597 A.D. In the Middle Ages, thousands of pilgrims came to Canterbury... more than to any other place in the English-speaking world for inspiration and renewal. Many are still drawn there today. My Canterbury Cross designs are a stylized interpretation, not intended to be replicas of the original Canterbury cross. H38 - H42 are all derived from my original design of Bishop Alard's pectoral cross (see H31, H32).